Person Attributes are data fields that display on the Person Detail page and display in Person Attribute ‘groups.’ Attribute fields can record several types of data, including numerical values, date values, string (text) values and uploading documents. Person Attribute fields can be made available in My and Public Lists so staff can query Arena easily. Many Person Attributes are core so they cannot be deleted. However, you can edit Person Attributes, including turning off ones your organization does not use. You can also add new Person Attributes. Before adding new Person Attribute Groups, determine the location of the Person Attribute Group. 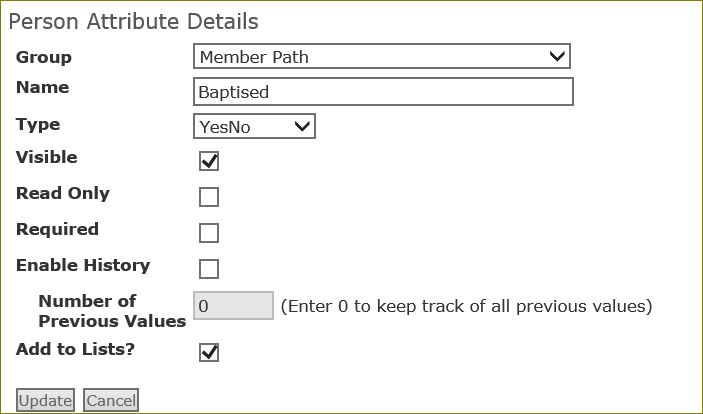 There are four available display locations on the Individual Information tab of the Person Detail page where you can add Person Attribute Groups — the Profile section which is located in the top portion, the Activity section where Sections, Tags and Member Data display, the Attendance section or the Personality section. For converted data where Person Attributes are created, be sure the Person Attributes are set to display and security has been applied as desired. All Person Attribute groups have system IDs. Person Attribute fields are organized by Attribute Groups. This name displays on the Person Detail page for the Person Attribute group. •Click the Attributes link to display the values of Person Attribute group. •The Display Location reflects where the Person Attribute group displays on the Person Detail page. •The System Group checkmark icon reflects if the attribute is core. You cannot delete system groups but you can elect not to display by setting the Display Location to None. Also, you can elect to customize system attributes instead of creating new ones. •Click the Security icon to make security permission changes for the Person Attribute group. Security applies to the group only, not the fields in the group. Changes you make also reflect in Security Roles. •Click and hold the Reorder icon to move the attribute groups to the desired order. Keep in mind the order is applied by Display Location. •Click the Edit icon to edit an attribute group name and display location. •Click the Delete icon to delete an attribute. To delete an attribute, you must first remove it from all records. You can also add a new Person Attribute. The only exception in the below steps is to add new fields. After adding new Person Attribute Groups, you likely want to add these to List Criteria for staff to use the criteria to create Lists. 1. Click the Edit icon. •Customize the name or location. •Select the Add to Lists check box to add this attribute group to the available List criteria. You also need to add the individual Person Attribute Group fields you want to be available. 3. Click the Attributes link for Person Attribute group to display available fields. 4. Click the Attribute Name link of the attribute you want to change. •Group – This is the attribute group to which the attribute belongs. Changing this moves this Attribute to a different Attribute Group. •Name – Enter the name of the field, such as How Received, Uniform Size, Background Check, etc. The name of an Attribute can be up to 125 characters. •Integer – This allows the user to enter a numerical value. •String – This allows the user to enter text. •DateTime – This allows the user to enter a date or use the calendar lookup to select a date. •Lookup – This option enables you to select an existing lookup type. •YesNo – This allows the user to select a check box for yes. •Decimal – This allows the user to enter a decimal value. •Currency – This allows the user to enter currency values. •URL – This allows the user to enter a HTTP link that opens a new web browser tab to that link. •Document – This allows the user to upload a document. A Document Type is required. •Visible – Select this option to display this Attribute with the Person Attribute Group. Remove the checkmark to turn off system values that your organization does not use. •Read Only – Select this option for the attribute to display only and not editable. •Required – Select this option to require the user to update the attribute when editing the attribute group. •Enable History – Select this option to enable Arena to keep the history as users change the value. A value in the Number of Previous Values is required. •Number of Previous Values – Enter the number of values you want to track. •Select the Add to Lists check box to add this person attribute field as available list criteria. 7. Repeat steps 7 through 13 for each Attribute for this Attribute Group. As you add attributes, click and hold the Reorder icon to move each attribute to the desired position. Set security for the Attribute Groups and each Attribute. You can also set security through Security Role Permissions. Users need View and Edit permission to the Attribute Group in order to edit any field associated with the Group. On the List Configuration page, you can make the new attributes available for users to select as criteria for My and Public List. Optionally, customize White Pages to display attributes on the Membership menu White Pages option. While you cannot delete system Person Attributes, you can delete non-system Person Attributes that are not used on either the Person Detail page or Lists. If you want to delete Person Attributes that have been used, first remove the values for each field. Use Lists to query where fields are used. Once you remove the use of all values, you can proceed with turning off the values in Lists and then delete the Person Attribute. 2. Click the Attribute Controls link for Person List. 3. Uncheck the specific attribute(s) and person attribute group. 4. 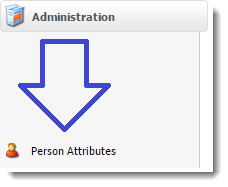 From the Administration menu, click the Person Attributes option located under the CUSTOMIZE heading. 5. Click the Attributes link of the desired Person Attribute. 6. Click the Delete icon to delete the attribute you want to remove. 7. A notification window displays. 8. Click the OK button. Arena deletes any lists using the attribute.